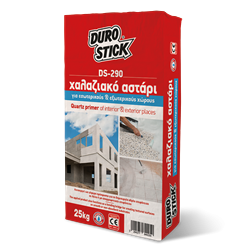 Multipurpose brushable polymer mortar with selected grain size quartz aggregates.The product is highly recommended for the proper preparation of smooth or non-absorbent substrates, before installing tiles over tiles or microcemento (pressed cement screeds) over tiles, mosaic or existing marble. The product is also an excellent bonding bridge for substrates before the application of filling/pitching materials or self levelling floor screeds over existing floor surfaces. Ideal as brushable product for applications on finished concrete poured in metal or wood moulds, while covering minor imperfections at the same time. Classified as product for surface protection of concrete surfaces, per EN 1504-2. 250-350gr/m2 thick coat, depending on the substrate. Paper bag of 5kg and 25kg each one.